MARK WARBURTON’S first season in charge of Rangers ended with Scottish Cup disappointment as Hibs laid to rest their 114-year hoodoo by winning the trophy at Hampden. A double from Anthony Stokes and an injury time winner from David Gray gave Alan Stubbs’ side a victory their supporters craved with Kenny Miller and Andy Halliday on target for the Light Blues. For Warburton the outcome of today’s final will be hugely frustrating but when reflecting on the season as a whole he will undoubtedly be proud of his squad’s efforts with the Petrofac Training Cup and the SPFL Championship trophy already in the silverware cabinets at Ibrox. The strides made in the past 11 months have been great, and with several new faces expected to be joining this summer there will be a real sense of excitement as the club gets ready for Premiership football. Warburton stressed in his pre-match press conferences that winning the Scottish Cup this season would be a bonus, but his team were more than capable of beating Hibs despite a three-week break in competitive fixtures. Unfortunately, they were unable to record one last big result this season and after the final whistle it was their Leith opponents who lifted the Cup. The pre-match atmosphere was electric this afternoon with Penny Arcade blaring out of the PA system followed by Hibs’ anthem Sunshine On Leith. And as the players emerged from the tunnel area the Rangers fans produced a stunning card display while the Hibs support waved green and white flags above a ‘Time For Heroes’ banner. With an impressive pyrotechnics display adding to the pre-match build up, the stage was set and it was the Light Blues’ Gedion Zelalem and Kenny Miller who got the action started from kick-off. After just three minutes however, it was Hibs who went a goal up with Anthony Stokes beating Wes Foderingham with a composed finish. 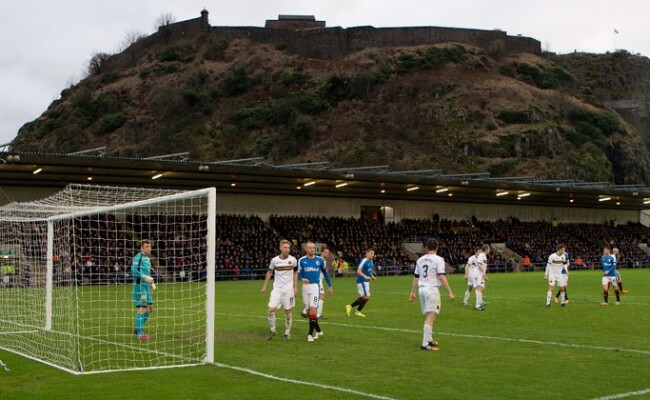 The forward was given time and space to enter the 18-yard box on the left flank and he made the most of Gers’ slackness by curling a low shot into the far corner of the net with his right boot. Hibs were understandably fired up and on seven minutes they could have doubled their advantage when Cummings was found darting in behind Rob Kiernan by Lewis Stevenson. He cut back inside the big Gers defender to get into a shoot position but his effort was blocked. At the other end Halliday hit the wall with a free-kick from 25 yards and a few minutes later he stuck a low drive, again from distance, which failed to find the target. The early goal certainly boosted Hibs’ confidence while Rangers were showing signs of nerves as they tried to settle into the game. A 50/50 challenge involving James Tavernier and Hibs’ Stevenson saw the Gers right-back hobble about while looking to his bench, but he quickly ran off the knock before providing an exceptional assist for Miller to equalise with 27 minutes on the clock. The Light Blues were in need of a moment of magic after a hesitant start to the game and when Tav sent in a teasing cross Miller got in front of his former team-mate Darren McGregor to power a brilliant header beyond Conrad Logan. Now was time for Rangers to settle but, remarkably, they came within inches of going behind once again before the half-hour mark in this end-to-end battle. Again Stokes was awarded too much space and from 25 yards he hit a powerful shot which struck the inside of Foderingham’s right-hand post and the ball bounced across goal before being cleared. 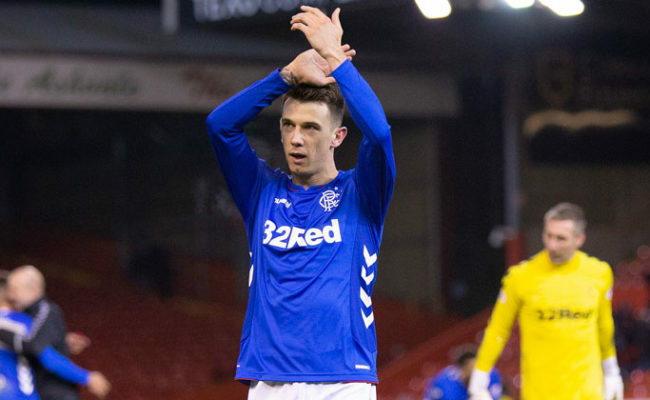 The action was relentless in the opening period and on 33 minutes the unmarked Miller rattled the crossbar with a header from Waghorn’s corner. 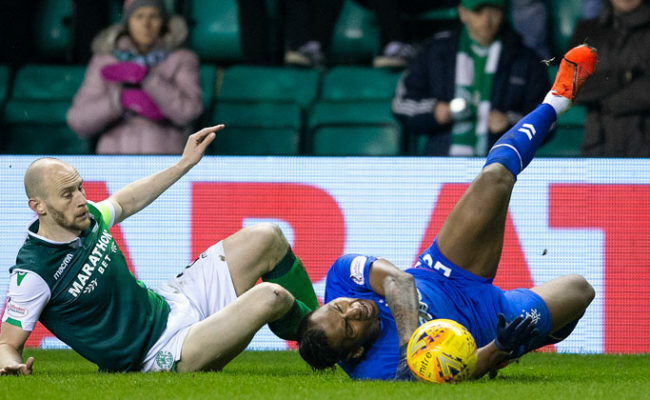 With chances coming at both ends this was the final any neutral supporter would have hoped for and on the 40-minute mark Hibs must have wondered how they didn’t get their noses back in front before the break. Foderingham had to be at his best to deny Stokes at his near post and he then came up trumps again to smother a shot at the feet of Cummings. A deep cross from Gray then skipped off the surface and Stokes couldn’t stretch his neck enough to divert the ball towards goal. Steven McLean’s half-time whistle allowed both sets of fans to catch their breath and it also gave the players time to regroup after a frantic opening forty-five. Into the second period and this pulsating contest showed no signs of slowing down and five minutes in Foderingham parried away another shot from the energetic Stokes. Before the hour mark Rangers produced a good passage of play and not surprisingly Miller was involved. Halliday fed the ball down the left wing to the former Scotland striker and his high cross was headed over by Waghorn. On 62 minutes Warburton made his first change to his side with former Hibee Dean Shiels replacing Gedion Zelalem for the final third of the game. Just over 60 seconds later, however, it was another Gers midfielder, Andy Halliday, who made it 2-1 with a glorious strike. The Copland kid snuck in between two Hibs players before smashing an unstoppable left-foot drive across Logan and into the net. It was stunning effort from the 24-year-old but the drama was not over there. With just 10 minutes remaining a corner from the left found Stokes at the near post and he headed high into the net in front of the jubilant Hibs fans. 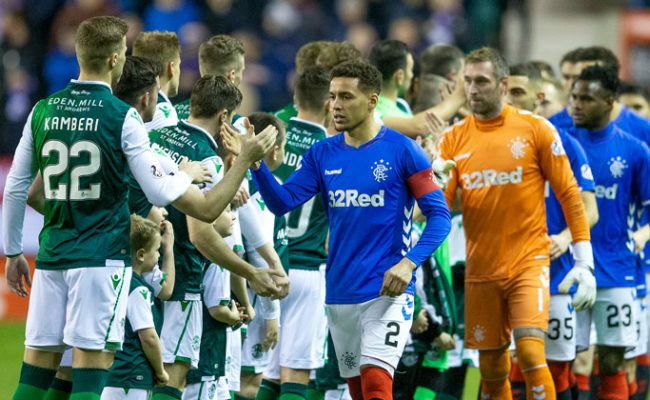 With all the noise now coming from the green and white half of the stadium it was Rangers’ turn to hold on and stay calm as Hibs started to exert more pressure at this crucial stage of the match. In injury time Foderingham again had to produce more heroics to deny Stokes, but his efforts were to be in vain. From the resulting corner, Hibs skipper David Gray headed past the big Englishman to end Rangers’ hopes of a treble. At the final whistle Rangers players cut dejected figures as they walked off the pitch amid disappointing scenes but they should all be proud of their achievements this season.